Those that actually solo mine crypto coins are familiar with the not user friendly way that things happen and mostly the lack of details on your solo mining statistics over time unlike when using a mining pool. Ethereum is a no exclusion from that rule when solo mining and with not that many pools and some pools having issues, even though the difficulty of the network is not that small, there are still quite a lot of people that solo mine… especially if they have more than just a few GPUs. 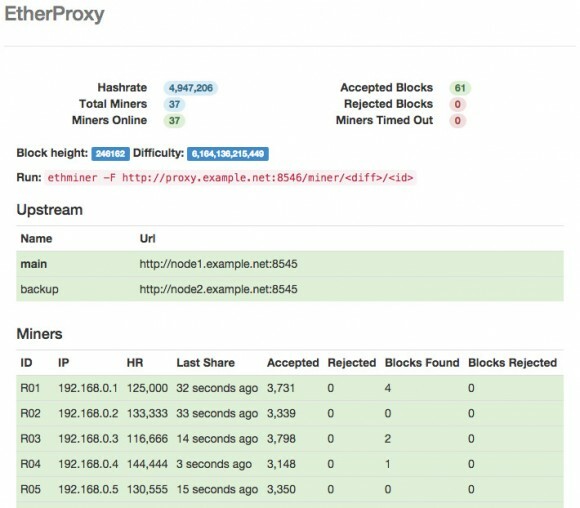 There is now a new open source project called ether-proxy which essentially is an Ethereum solo mining proxy that can help you keep track on how your solo mining for Ether is going on with multiple mining rigs, though it will work even with a single one. EtherProxy relies on Go and needs geth (the Ethereum Go client in order to function as a backend) with the mining part happening just like you do with ethminer pointed at a mining pool. In the local proxy url you set for ethminer to use you can set the share difficulty as well as an ID for each mining instance (or mining rig) that you are using. All the basic stats that you need is being displayed in a clean and simple web-based interface for you to keep track on things like running status of mining rigs, hashrate, blocks found and so on. If you want to try the project yourself, there is already a Windows binary release available to save you some trouble or you can compile from the source code yourself.